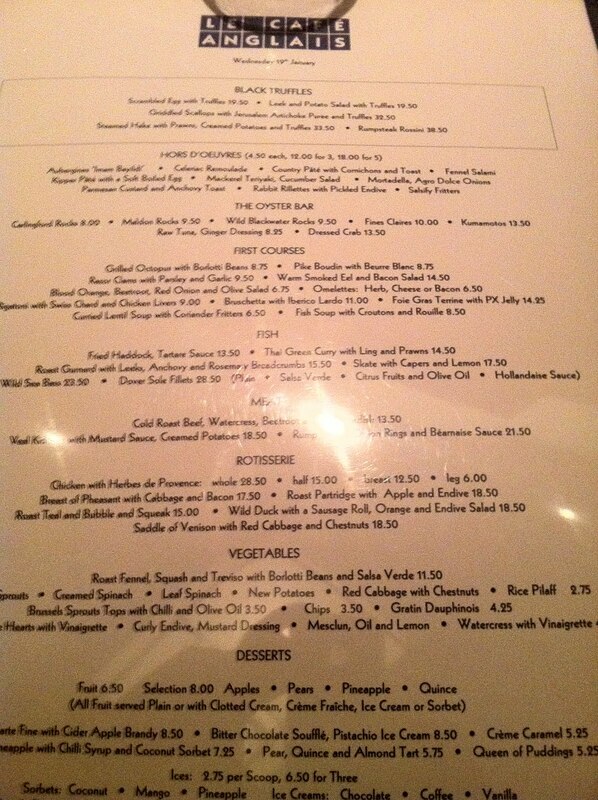 At first, everything about Le Cafe Anglais seems huge. There's the room, so massive you can barely see from one end to the other and incorporating two sizeable bars. 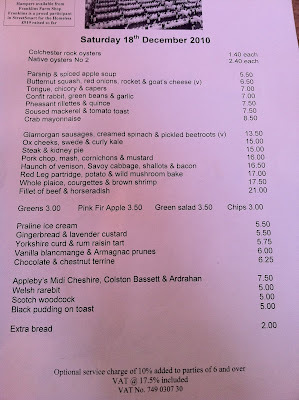 And the menu, which not only contains a bewildering number of dishes organised into nine or ten sections but is presented on a ludicrous single card in a clear plastic envelope which covered our small table like a laminated tablecloth. Having such a large number of dishes to choose from may have ordinarily been a problem - I'm inherently suspicious of big menus which too often point towards a lack of clear identity in a restaurant - but being pretty much the last food blogger in London to visit Le Cafe Anglais I came armed with a short list of 'must-orders', and anyway a quick scan of the items on offer revealed an attractive and reassuringly solid French Bistro theme of seafood and grilled meats. No pasta penne next to chicken tikka masala here. 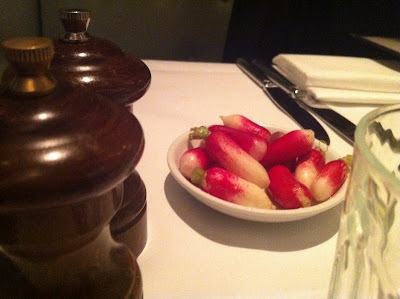 Nibbling on raw radishes was a nice enough way to start the evening, although I was a bit miffed to later discover these came with a £3.70 cover charge. Am I the only person to find the idea of a restaurant automatically giving you something you didn't order, and then charging you for it, a bit off? And I'm sure it makes good business sense to offer "still or sparkling" and not tap water, but isn't it about time tap just arrived in restaurants automatically and we all put the environmentally damaging and vacuous bottled water industry out of business? Sorry, I'll get off my high horse now. It was a delight, not to mention somewhat of a relief, to discover that the famed Cafe Anglais Parmesan Custard and Anchovy Toast was just as amazing as I'd been told. 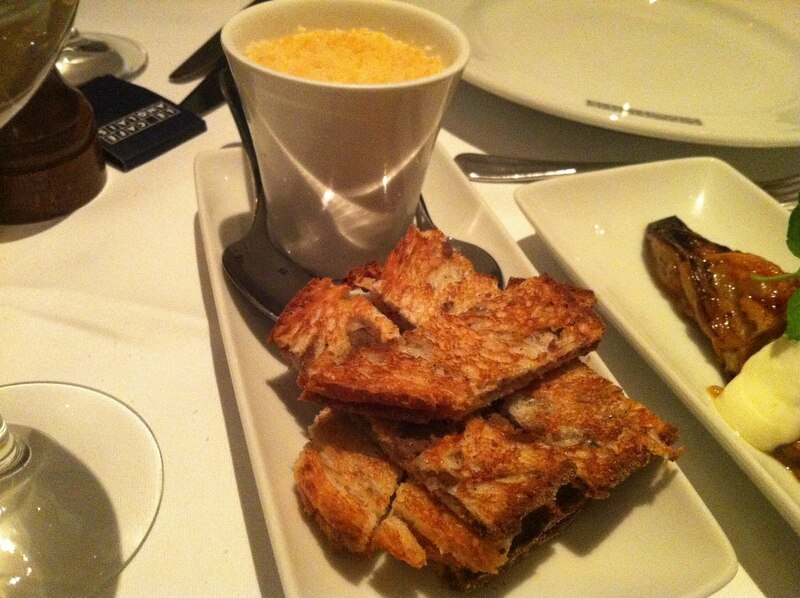 A thin but powerfully salty layer of anchovy was sandwiched in-between two delicate thin slices of toast, which you dip in kind of a light cheese mousse (the "custard") topped with crunchy grilled parmesan. It was fun and tasty and as far as I know unique to this restaurant. 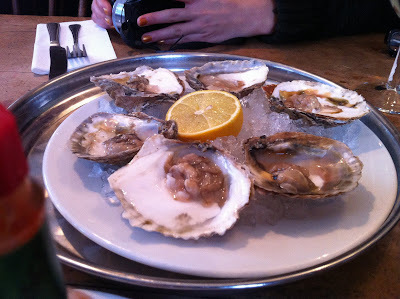 Carlingford rock oysters, which arrived at the same time, were also superb - somehow loosened while retaining all of their juices, a trick you don't see very often. But I wasn't at all a fan of some cold, formless aubergine 'Imam Bayildi' which was just unseasoned, oily gloop. I probably would have been more impressed with the pike boudin if I'd not had a much better version at Brawn last month. This was admittedly a few quid cheaper than the one at Columbia Road, with a plain butter sauce instead of that fantastic lobster bisque, and it still had the same light texture inside, but there was something faintly unsettling about the overall taste - slightly synthetic, "like boil in the bag fish" my friend pointed out. 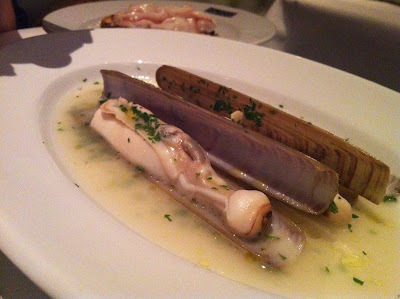 And razor clams weren't at all pleasant - chewy and tasteless in a thin, insipid sauce that needed a lot more flavour and a lot more seasoning. If there's any seafood that desperately needs a Spanish-style grilling over charcoal, it's razor clams. 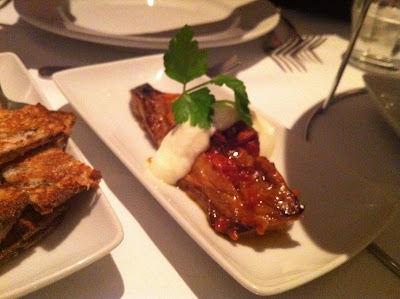 Fortunately, bruschetta with Iberico lardo saved the day - in fact they were so astonishingly good it's hard to believe they came out of the same kitchen as those razor clams. 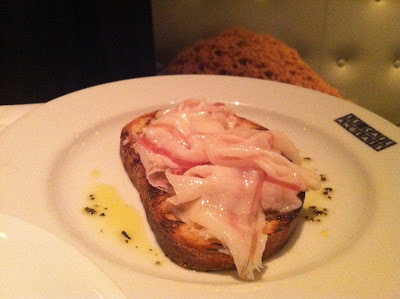 I am the worlds biggest fan of Iberico ham anyway, and here, draped over charred bread and drizzled with olive oil, they made the most perfect open sandwich you can imagine. 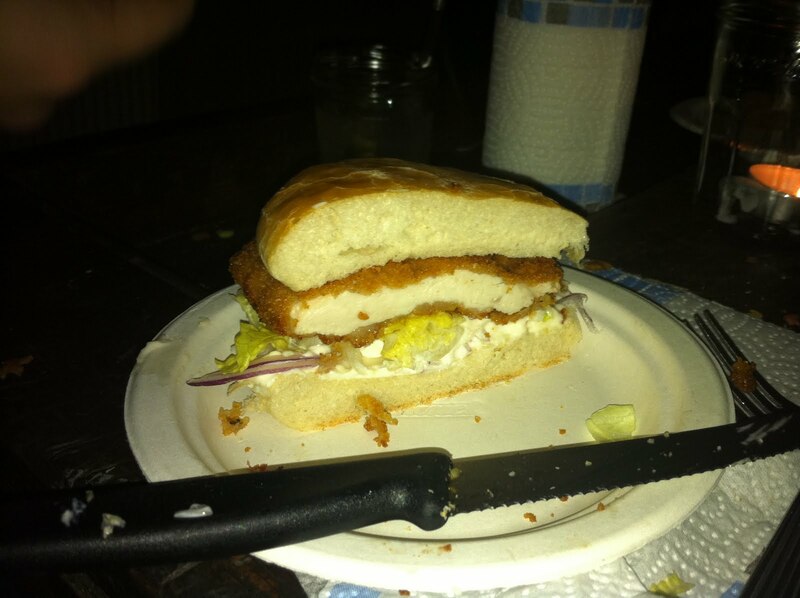 Something about the slight bitterness of the char on the bread and the soft rich fat made a killer combination. 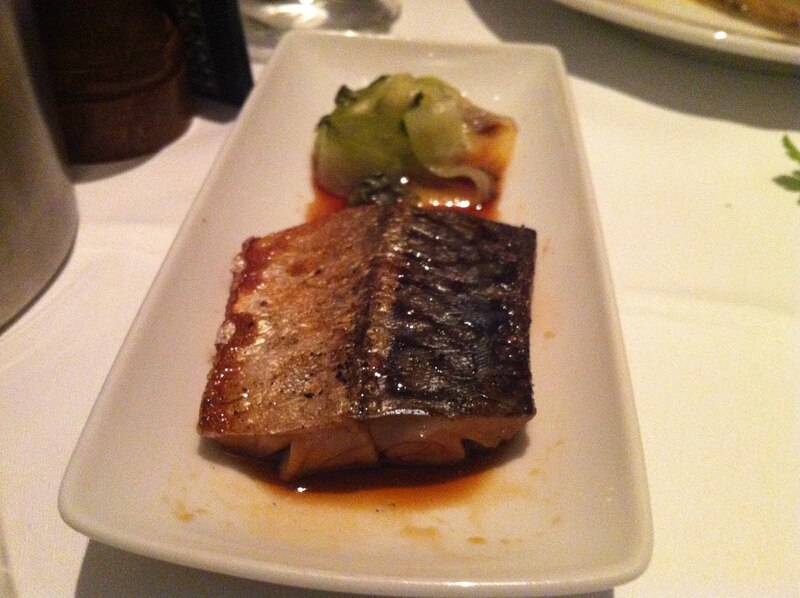 Also very good was a small fillet of mackerel in a teriyaki dressing, boasting a good crispy skin and accompanied by some delicate sweet pickled cucumber. Desserts were unspectacular but still pleasant enough to be worth the effort. 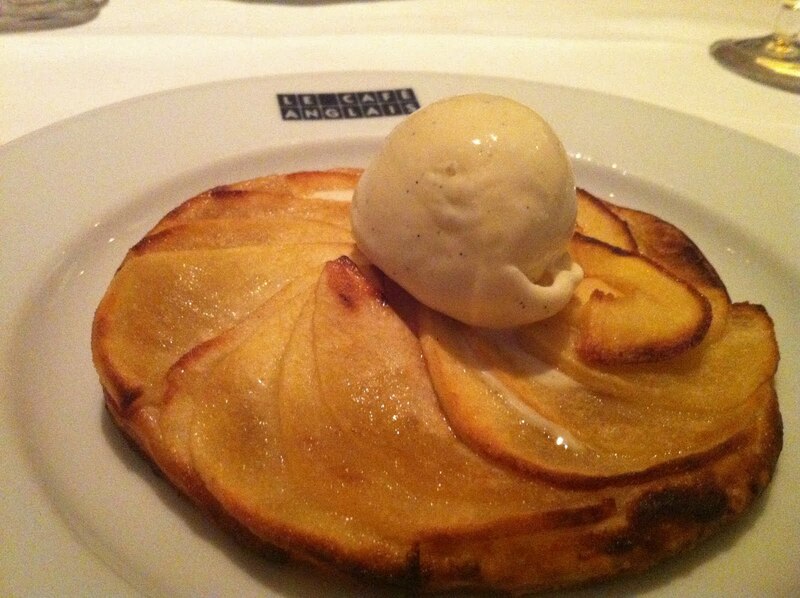 My apple tart maybe would have been better if it was slightly less dense but had a lovely flavour and was topped with good homemade vanilla ice cream. 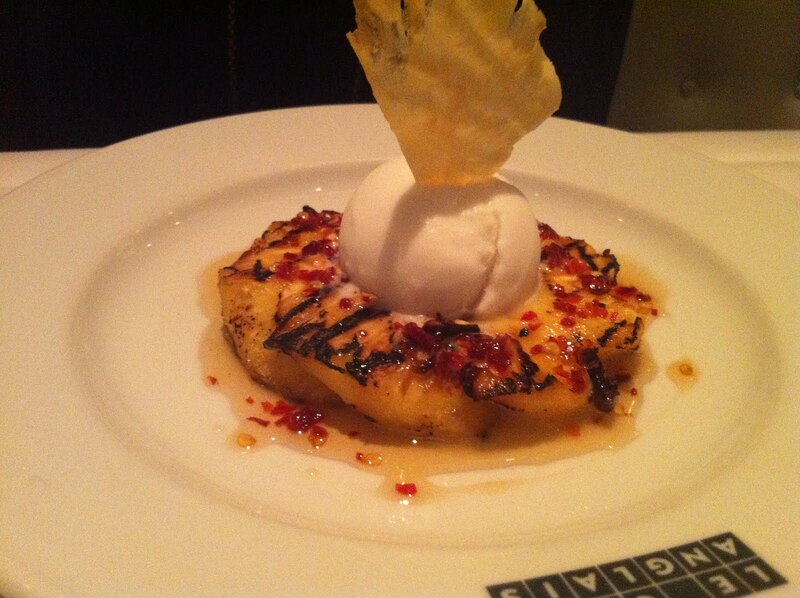 Grilled pineapple too had an interesting mixture of flavours and textures, flakes of chilli and cloves studding the caramelised fruit. We had to get the bill redone a couple of times - first they charged us for extra courses, then didn't account for our Toptable voucher, but even after the corrections this was a pricey meal - about £125 for two with a bottle of one of the cheaper wines on the list and a cheeky digestif with the desserts. 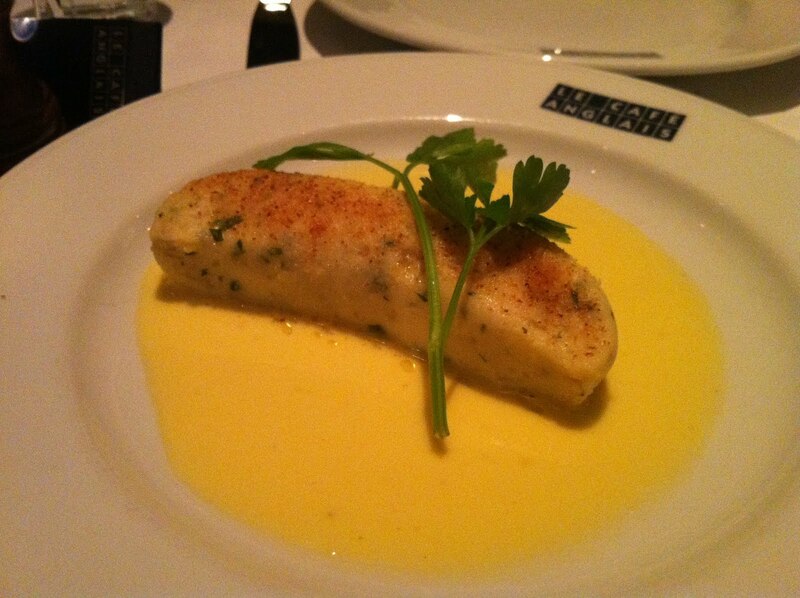 And if there were a few more dishes that matched the level of the parmesan custard or the lardo, and a few less like the aubergine or razor clams, then it would probably have been worth the money, but as it stands I can't help feeling there are better ways to spend over a ton in central London. 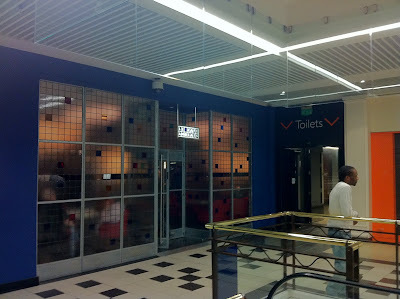 We emerged into the harsh strip-lighting of Whiteleys shopping centre largely sated but not exactly impressed enough to recommend it to anyone else, which is probably significant. 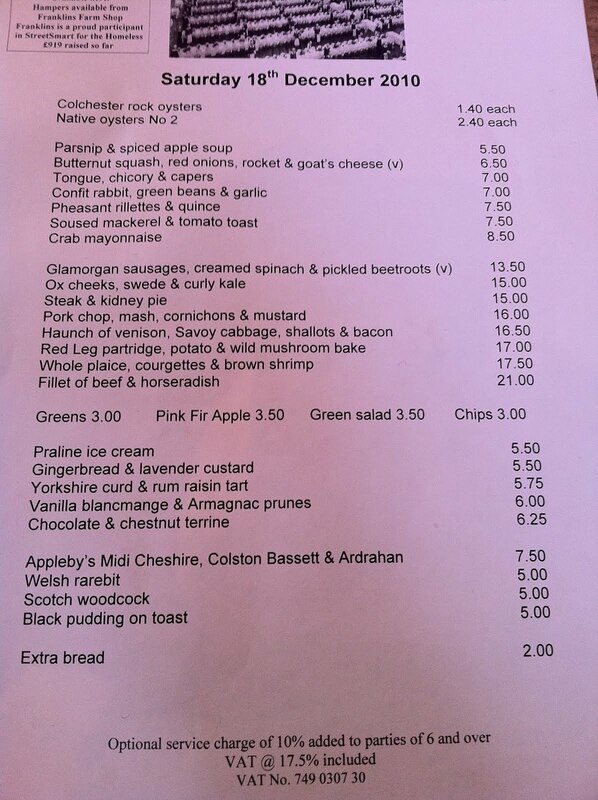 Rowley Leigh, the man behind Le Cafe Anglais, was in the restaurant last night but not cooking - he was on another table having dinner with friends. Given his well-publicised aversion to bloggers and their pesky habit of taking photos of their meals then putting them on the internet, it's probably just as well that he - ironically - didn't notice me snapping away, and in all likelihood will never read this review. 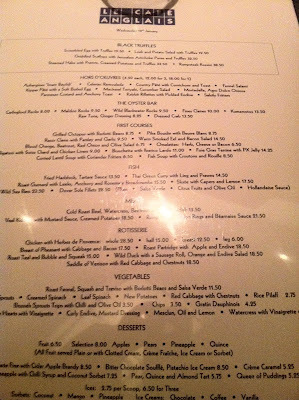 But I bear no grudge to Rowley, who is obviously a very talented chef and runs a very successful restaurant (even this huge space was full last night), I just wish my meal had lived up to the size of the room, menu and price tag. In an evening of hits and misses, the misses were never disastrous and the hits may just be enough to tempt me back. 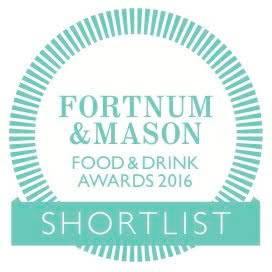 After all, where else in London am I going to go for my fix of parmesan custard and anchovy toast? I had almost given up trying to find decent Thai food in London. In fact, more than that, I had given up. At one time I had a (short) list of potentials that I'd collected from recommendations and review sites and I was quite prepared to travel far and wide in the mindlessly optimistic hope that eventually I would come across something worth paying for. 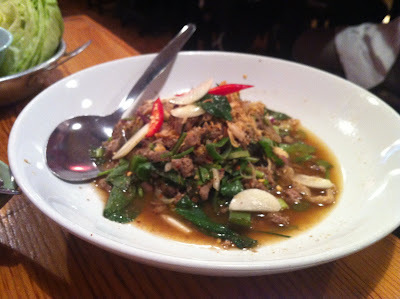 It always seemed so odd that while Indian/Pakistani, Vietnamese, even Malaysian cuisine had at least a couple of restaurants that did them justice, all London had to fly the flag for Thai food was a few branches of Busaba Eathai (tame, but OK), Patara (OK but expensive) and Nahm (hugely expensive and still just OK). Where were the Thai restaurateurs doing for their cuisine what Mien Tay were doing for Vietnamese or Tayyabs for Pakistani? I assumed there must be somewhere out there, but successively more depressing experiences in places like South Norwood (I wasn't exaggerating when I said "far and wide") eventually got the better of me and I stopped trying. So why, after all that, did I find myself in Hammersmith on a damp Saturday night, risking further disappointment? The main catalyst was a thoroughly dispiriting press trip to a flashy new Thai restaurant/bar in Fitzrovia called ORA, where we nibbled on starters that looked like something Kerry Katona might advertise followed by hardly very exciting mains that (I learned later) would have pushed the price per head to around £50. The owners, judging by the "no expense spared" decor, bespoke cutlery and overblown branded reception area (perfect for being spotted in Heat magazine, I imagine) are probably far more interested in attracting along minor celebs for a photo opportunity than providing a value for money dinner, and although sadly they are hardly unique in holding these priorities, it doesn't make it any less annoying. And it was after I'd slunk away home from ORA, sick from soggy crab cakes and sweet cocktails, that my determination to finally find a Thai restaurant worth the money was reborn. Harnessing the power of Twitter, and the phalanx of supremely well-informed and well-travelled foodies that lurk there, I booked a table at 101 Thai Kitchen. 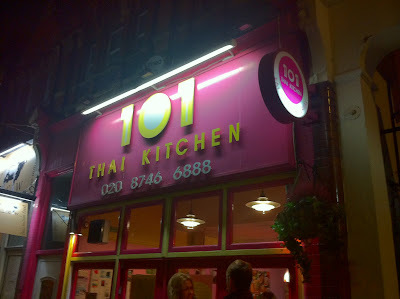 I know this shouldn't really mean anything, but I couldn't help being pleased to see a number of what looked like Thai families amongst the boisterous crowd inside 101 Thai. In all likelihood there's no reason why Thai diners shouldn't make as poor a choice of restaurant as anyone else, but even so, it served as a Sign. We browsed the large menus helpfully appendixed with a pictorial guide to all the ingredients (some more necessary than others - I'm quite happy to discover what sator is, but I'm already quite familiar with garlic thankyouverymuch) but in the end made most of our choices based, yet again, on tips from the Twitterati. 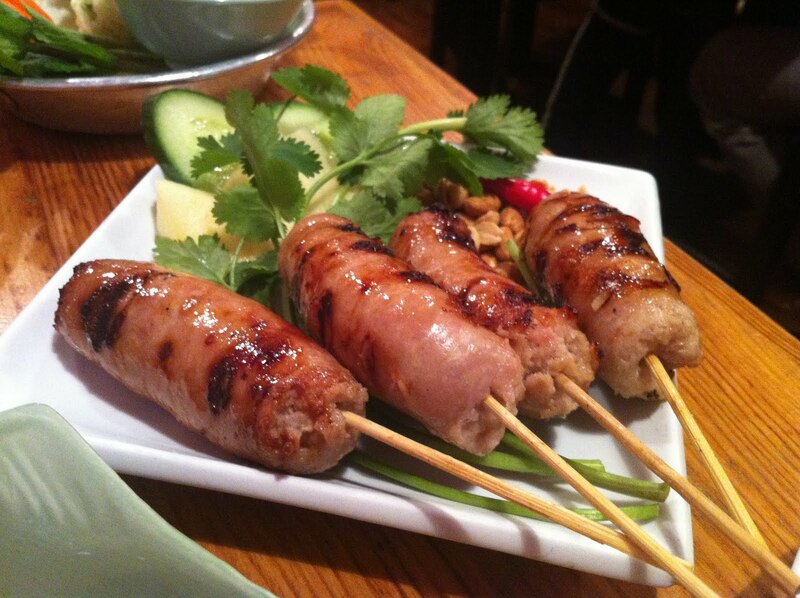 First to arrive were the Isaan sausages, which had a pleasing loose texture and sweet caramelised skin. 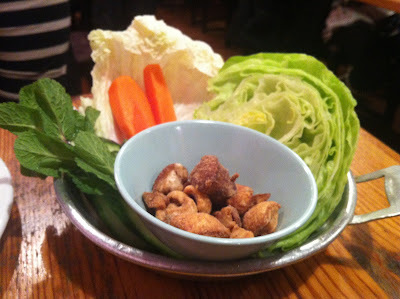 They were served with some simple Thai greens, and some dry roasted peanuts. 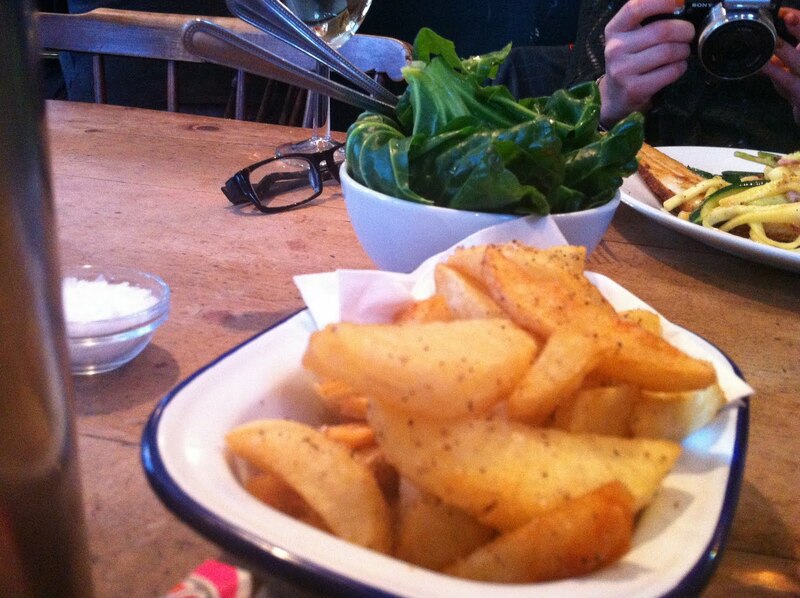 Yes, those dry roasted peanuts, like you get in the pub. A bit odd, you might think, but who doesn't like dry roasted peanuts? Laab is a kind of meat salad, a traditional recipe from Northern Thailand (so I'm told) and very nice it was too. In this case the meat was duck, but also included a healthy smattering of offaly bits which provided texture and some added complexity of flavour. It was surprisingly fiery too, shot through with a healthy handful of red chilli and who knows what other spices. The star dish overall was this fried sea bass, served whole but helpfully filleted into two gorgeously crispy halves. 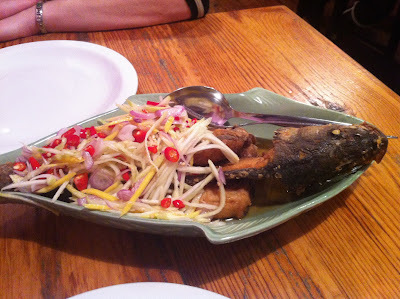 The flesh of the fish was moist and delicately sweet, with the colourful salad topping consisting of shallots and red chillies and bean sprouts amongst, I'm sure, much else. On the one hand this was a fairly straightforward dish but it is never easy to cook fish this well, as anyone who's ever had a mushy overdone specimen can tell you. The flakes of sea bass fell apart with the gentlest of prods, their crispy coating working addictively in the mouth. Very good indeed. Along with our food arrived a selection of greens - just plain vegetables, carrots, iceberg lettuce, mint - and a bowl of pork scratchings. No, not some kind of traditional Thai pork, or exotic Asian preparation, these were Mr Porky's. 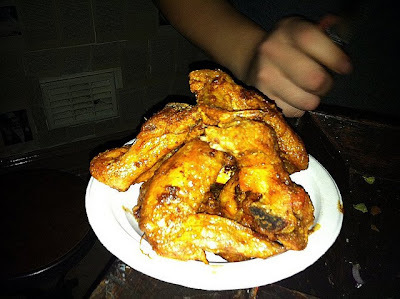 You could either criticise a bowl of Mr Porky's pork scratchings for not been authentically Thai, or just shrug your shoulders and roll with it. We opted for the latter. I suppose, in the end, much of what makes a good restaurant is very difficult to put your finger on. The food at 101 Thai Kitchen was excellent, of course, but there was something about the honest presentation and bold colours and flavours that I just found irresistible - the character of the place just shone. This was probably helped by the service, our waitress being so friendly and helpful that if she'd presented us with trays of Iceland brownfood and sweet chilli dip we would probably still have enjoyed ourselves. 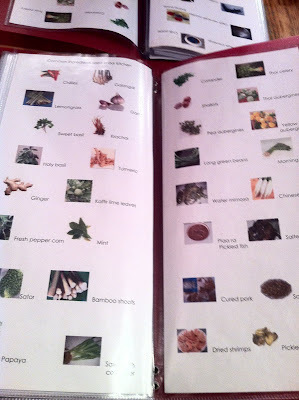 But homely details like the hilarious appearance of pub snacks masquerading as authentic Thai ingredients (no pictures of them in the glossary, I notice) gave the whole experience real charm. I am happy, not to mention relieved, to report that the long search for a good Thai food in London is over, and for only £25 a head with a bottle of wine. Other restaurants in London may have the engraved cutlery, bespoke uniforms and tabloid photo opportunities, but 101 Thai Kitchen has the heart. I read somewhere a while ago that the most requested final meal by death row inmates is a cheeseburger and fries. I used to think that this was a bit of a wasted opportunity - if you could ask for anything, literally anything, wouldn't you either go a bit more heavy on the expensive ingredients (the lobster tail and steak chosen by this rather unsavoury character seems suitably decadent) or alternatively treat the privilege as a chance to pull one final prank on your captors - "A large bowl of curried cormorant tongues and a plum on a doily please." But a cheeseburger? Really? Don't convicted murderers have any imagination? Of course, that was before I tried the Meatwagon Bacon Cheeseburger. It remains not only the best burger I've had anywhere in the world (and yes, that includes these guys), but has become nothing short of an obsession. 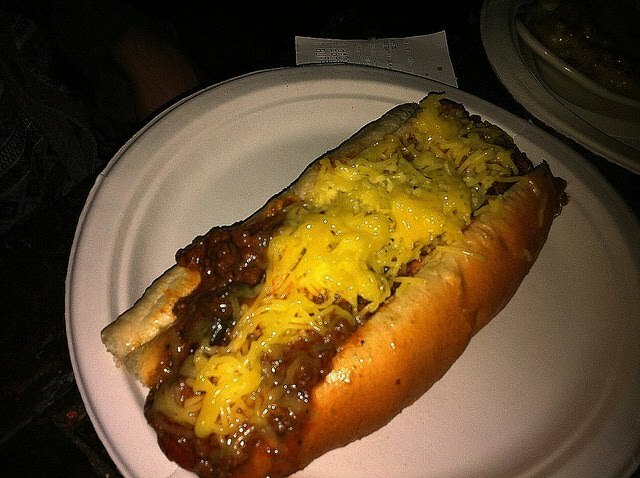 I dream about its salty, beefy goodness (a special blend mince, never frozen, precisely 15% fat), its crispy bacon topping (boiled, pressed and crumbled above the beef, adapted from a method used in Hodad's in California), the slick of melted yellow "cheese" (from a secret supplier). I tracked the movement of that silver van around London like a man possessed, turning up first in the queue at as many showings as I could possibly manage (though avoiding North London, obviously - I do have some dignity). I once, and I'm not proud of this, ate three of them in one sitting because I was worried I wasn't going to be able to make the next date he was in town. In fact, sod it, I am proud of that. And if you're shaking your head in disbelief and wondering how on earth any foodstuff can be worth that kind of devotion, then you've not tried it. Simple as that. But then, disaster! The Meatwagon, burger van of dreams, mobile purveyor of beefy heaven, was stolen, and the future availability of my bacon cheeseburgers (and yeah, I suppose, the sole income and livelihood of owner Yianni Papoutsis, whatever) was cast into doubt. I was inconsolable, but a brave appearance of the van-less Yianni at the Florence a few days later, manning hired grills in the freezing pub garden like the trooper he is, demonstrated that the concept of the Meatwagon can live on even without the existence of the van itself. 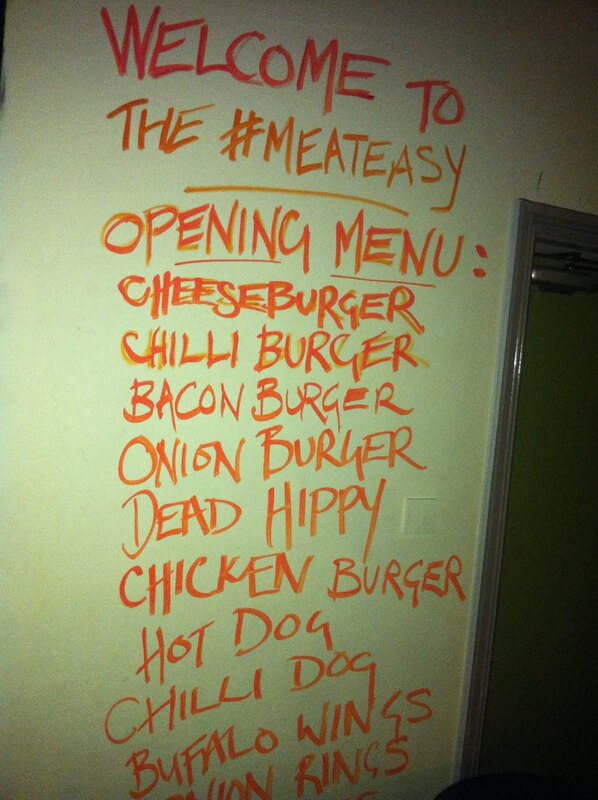 Which brings us to a soon-to-be-renovated old boozer on the New Cross Road, and the glorious birth of #MEATEASY. For a limited time only, in fact barely a couple of months, Yianni has access to a proper kitchen, a small but efficient group of waiting staff, and a fantastic cocktail bar run by Soul Shakers, in a temporarily but remarkably effectively decorated function room above the Goldsmiths Tavern. The space and equipment has allowed him, for the first time, to do proper fries, and bloody good they are too, crunchy outside and soft within, gently salted and of correct proportions (ie. thin). Buffalo chicken wings, which made frustratingly rare appearances on the Meatwagon's menu, also appear at #MEATEASY - simply slow-roasted in (I believe) Frank's Hot Sauce and deep-fried, they have remarkably crispy skins despite not having any breadcrumb coating, and knock out of the park the poor efforts I've had elsewhere in the capital; onion rings are so cleverly cooked you can bite off chunks without having the onion draw out of the middle of the batter like a rubber band, a feat not even Hodad's themselves could manage; the sensational chilli dog uses a firm and flavoursome beef sausage inside a soft bun, topped with rich chilli and melted cheese; and the chicken burger was a revelation - crispy and moist in all the right places, dressed delicately with sweet mayonnaise and lettuce. 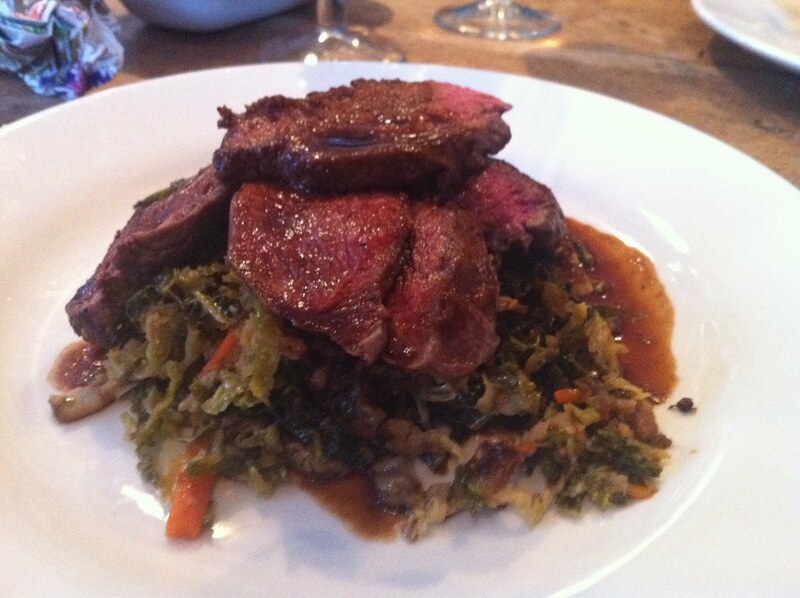 Like every other item on the menu, it is meticulously researched, perfectly constructed and unbelievably delicious. And, of course, there's the bacon cheeseburger. Loose, pink minced beef soaked in American cheese, topped with a layer of crunchy, salty pig and shredded lettuce, all inside a fresh sourdough bun that never loses its shape or collapses despite the frankly astonishing amount of beef juice that gushes out with every bite. 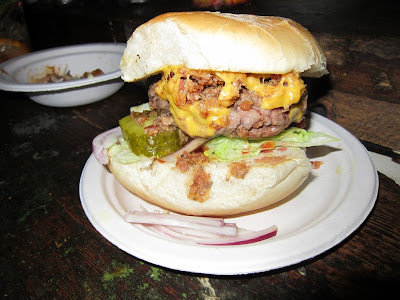 I hoovered up the buffalo wings and chilli dogs and fries with the enthusiasm they deserved, but the bacon cheeseburger will still be my first love; I ate it in rapt silence, alone in my own little world, savouring every second. That you should make every possible effort to visit the #MEATEASY while you can is beyond doubt. My hyperbolic endorsement has the usual caveat - Yianni's astonishing attention to detail and devotion to the end product come with the kind of timescales that stretch the concept of "fast" food somewhat - but you know what? It's bloody worth it. So grab a seat, kick back, grab a dry martini, place your order and I absolutely guarantee that the first moment that bacon cheeseburger touches your lips all will be forgiven. be completely refurbished and reopen under its original name ‘The New Cross House’. 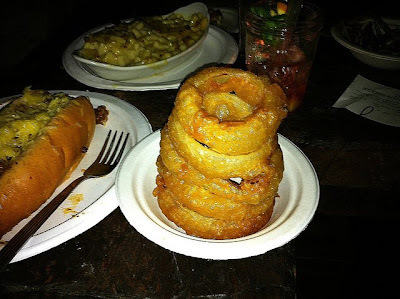 Thanks to Lizzie of Hollow Legs for the pictures of the chilli dog, wings and onion rings, and Euwen for the shot of the bacon cheeseburger. So, should we complain in restaurants when something goes wrong? Absolutely, yes! But we should complain as soon as we can to give the restaurant time to fix the problem, not on the way out when they can do nothing. Believe it or not, I like it when customers complain because it opens a dialogue whereby I can show off and impress by how good the response and the ‘fix’ is. You should also complain about small things as well as big things – it helps the restaurant improve and, ultimately, means that return visits should get better and better as the restaurant sharpens its practices. We want to know if the knife is dirty. We want to know if the Virgin Mary isn’t spicy enough. We want to know if the table wobbles. Which, again, from the restaurant's point of view, I can completely understand. Of course they want to know if there's something they're not doing right, and presumably if all their customers complained about everything they could think of all the time, it would be like having a vast, extremely grumpy but constantly updating market research programme specifically tailored to making your restaurant as good as it can possibly be. 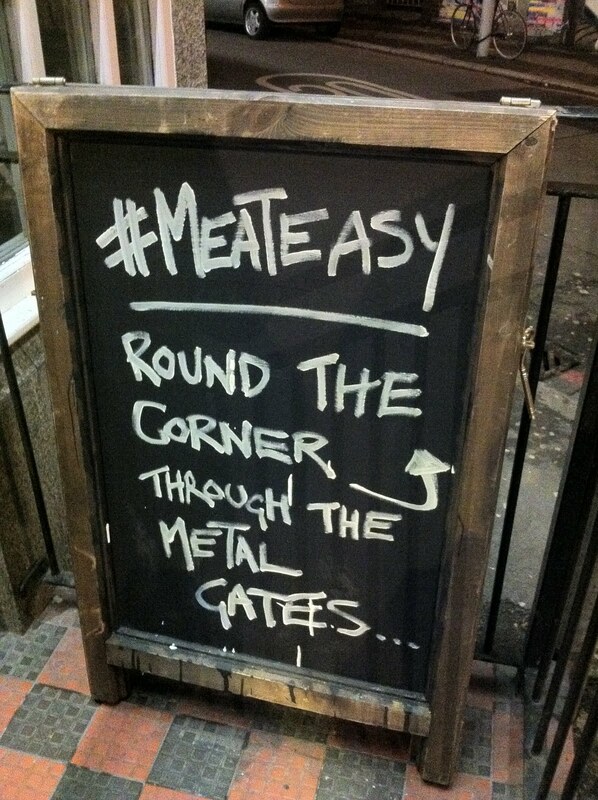 It would make for a very odd atmosphere for dinner, perhaps, but at least the message would get through. The thing is, though, I hardly ever complain. If I get the wrong dish, or my beef is overcooked to oblivion, or there's a shard of broken glass in my ice cream, then of course I'll say something. But usually nothing short of a complete disaster will prompt any kind of intervention on my part, for various reasons. Firstly (and mainly, I suppose) it's that good old English attitude of not wanting to make a fuss, and to gamely plough on with the meal, hoping that if you don't mention it it will go away or fix itself. Stupid, I know, but that's the English for you - and despite the impression you may get from reading the posts on this blog, I really do always want to enjoy myself when I go out for a meal, not sit there moaning. Also, now more people know I'm a food blogger and - most importantly - know what a food blog is, I'm very conscious of coming across as rude or arrogant (or at least even more rude or arrogant than normal), showboating my superior taste and knowledge of eating out and boring everyone else senseless. And thirdly, I'm not convinced that there is always something a restaurant can do to improve things. Take, for example, this meal at Barbecoa - the quality of the produce was poor, the food unadventurous and the whole thing rather overpriced, but nothing was inedible and I wonder what our charming waitress would have said if I'd pointed that out - "I'm very sorry sir, I'll go out and find a new meat supplier this very second. And in future we won't charge any extra for the bread." 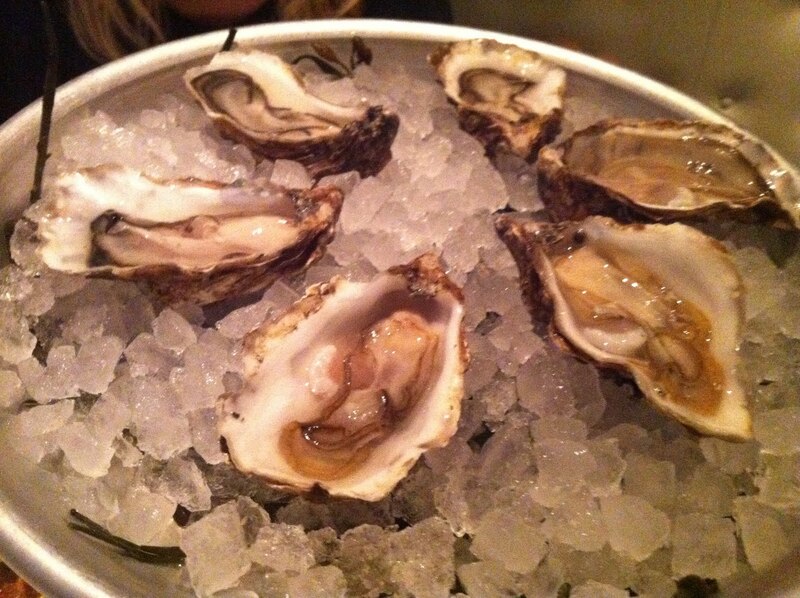 Tiny, carelessly opened and less "loosened" than "hacked to bits", these hardly inexpensive natives (£2.40 a pop) nevertheless, despite the sad lack of briny liquor and poor presentation, tasted pretty good - crunchy and fresh. And while they were disappointing in many ways, they weren't quite disastrous enough to warrant a complaint, so in the interests of good company and a pleasant lunch, nothing was said. 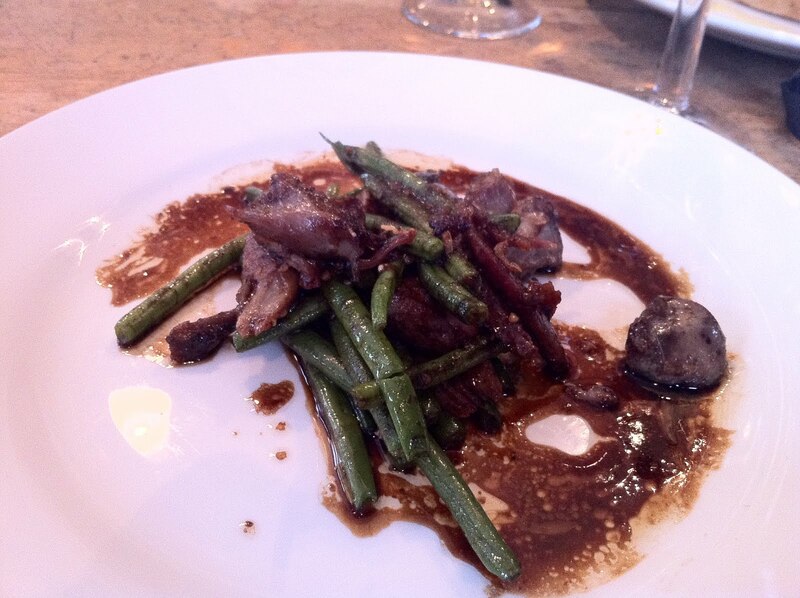 Starter of confit rabbit with green beans certainly didn't warrant a complaint, because it was bloody good. The veg was crunchy fresh, the salty rabbit seasoned the dish very well, and I particularly liked the inclusion of a couple of bits of offal for interest and texture. Unseasoned, unbuttered, undercooked and pretty much inedible sprout tops, it was like eating damp rubber, only not quite so enjoyable. This was not just a matter of opinion, this was objectively wrong, and so, emboldened by my blogger friends we mentioned it to the waitress, who apologised and took it off the bill. A good result, then, and a good example of a successful complaint. And then, just as they were winning us back with their management of the whole sprout tops issue, the Franklins staff spoil it again by standing around chatting amongst themselves behind the bar and completely ignoring our requests to pay. In the end, one of us had to march up to the bar, credit card in hand, and physically interrupt the happily distracted group in order to get their attention. And how do you complain about that? "We think watching you socialise while we're trying to pay for our meal is incredibly irritating." I can't think of a way of making that complaint sound anything other than deliberately unpleasant, and of course nothing was said. Mind you, you'd hope they'd get the hint something was wrong when confronted by a stressed customer brandishing their VISA. I suppose, in the end, a happy balance needs to be struck between the needs of a restaurant manager for accurate and constructive feedback on his or her restaurant, and the needs of the punter to have a nice, quiet, peaceable evening. I completely understand the frustrations of any business owner, not just restaurateurs, who serve their product to what for all they know are happy clients only to read a furious rant on a consumer review site (or, er, a food blog) the next day, but they must understand it's human nature, well, English nature at least, to not make a fuss about every little thing and run the risk of annoying your date. I will never be completely comfortable with complaining in restaurants, and to be honest don't like eating out with people who are; ultimately, I won't be made to feel guilty for not feeding back a comprehensive list of action points after a meal - it's my choice, I'm a paying customer, not a business consultant. If you think that's misguided, or just plain cowardly, then perhaps you're right, but I don't think I'm in the minority. Feel free to prove me wrong though, and I'd be very interested to see what everyone else out there thinks, so please leave comments, rebuttals and, yes, even complaints, below.